Each morning I punch my code into The Chronicle’s voice-mail system. Most of the time, the messages are from sources calling me back or editors with a few “minor queries” about a story I’ve turned in. Sometimes, however, they’re from Norman. Hi Tom. Norman here. I’ve been reading a wonderful biography of Thomas Wolfe and I found out the most interesting thing: He drank 12 to 18 cups of coffee every day! No wonder he was manic and high and low and sideways. When I wrote my books, I certainly drank coffee, but if I had four or five I thought that was a lot. How many do you have? One, probably. Or two? Norman Zierold is a spokesman for Maharishi University of Management, a Fairfield, Iowa, institution dedicated to “the full awakening of consciousness.” The last time I talked to him we discussed the recent suicide of Hunter S. Thompson and how Thompson worshiped F. Scott Fitzgerald. Norman believes the final page of The Great Gatsby is about as close to perfection as prose is likely to get. I can’t argue with that. He is also a fan of W. Somerset Maugham; I’ve never read anything by the British novelist and playwright, but I plan to, on Norman’s recommendation. For more than two years, Norman and I have spoken on the phone at least once a month. Sometimes it’s been once a week. He has sent me scores of e-mail messages and who-knows-how-many packages containing detailed information about the university’s latest project. In all that time, I haven’t written a single word about Maharishi University. That’s not because there isn’t plenty to write about. For instance, did you know that much of the food served in the university’s cafeteria is grown by students? Did you know that students and faculty members meditate twice a day in two gold-domed buildings? Were you aware that the university has received more than $20-million from the National Institutes of Health to study the effect of meditation on reducing heart disease, hypertension, and stroke? Interesting stuff. But other stories have come along and Maharishi always gets pushed to the back burner. It’s just what happens. 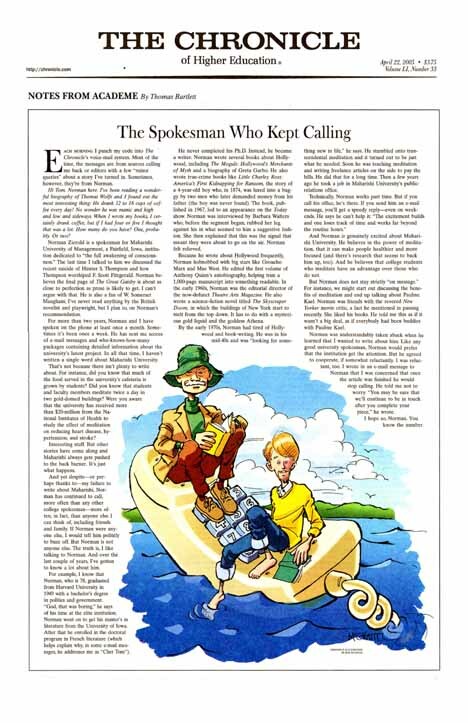 And yet despite — or perhaps thanks to — my failure to write about Maharishi, Norman has continued to call, more often than any other college spokesman — more often, in fact, than anyone else I can think of, including friends and family. If Norman were anyone else, I would tell him politely to buzz off. But Norman is not anyone else. The truth is, I like talking to Norman. And over the last couple of years, I’ve gotten to know a lot about him. For example, I know that Norman, who is 78, graduated from Harvard University in 1949 with a bachelor’s degree in politics and government. “God, that was boring,” he says of his time at the elite institution. Norman went on to get his master’s in literature from the University of Iowa. After that he enrolled in the doctoral program in French literature (which helps explain why, in some e-mail messages, he addresses me as “Cher Tom”). He never completed his Ph.D. Instead, he became a writer. Norman wrote several books about Hollywood, including The Moguls: Hollywood’s Merchants of Myth and a biography of Greta Garbo. He also wrote true-crime books like Little Charley Ross: America’s First Kidnapping for Ransom, the story of a 4-year-old boy who, in 1874, was lured into a buggy by two men who later demanded money from his father (the boy was never found). The book, published in 1967, led to an appearance on the Today show. Norman was interviewed by Barbara Walters who, before the segment began, rubbed her leg against his in what seemed to him a suggestive fashion. She then explained that this was the signal that meant they were about to go on the air. Norman felt relieved. Because he wrote about Hollywood frequently, Norman hobnobbed with big stars like Groucho Marx and Mae West. He edited the first volume of Anthony Quinn’s autobiography, helping trim a 1,000-page manuscript into something readable. In the early 1960s, Norman was the editorial director of the now-defunct Theatre Arts Magazine. He also wrote a science-fiction novel titled The Skyscraper Doom, in which the buildings of New York start to melt from the top down. It has to do with a mysterious gold liquid and the goddess Athena. By the early 1970s, Norman had tired of Hollywood and book-writing. He was in his mid-40s and was “looking for something new in life,” he says. He stumbled onto transcendental meditation and it turned out to be just what he needed. Soon he was teaching meditation and writing freelance articles on the side to pay the bills. He did that for a long time. Then a few years ago he took a job in Maharishi University’s public-relations office. And Norman is genuinely excited about Maharishi University. He believes in the power of meditation, that it can make people healthier and more focused (and there’s research that seems to back him up, too). And he believes that college students who meditate have an advantage over those who do not. But Norman does not stay strictly “on message.” For instance, we might start out discussing the benefits of meditation and end up talking about Pauline Kael. Norman was friends with the revered New Yorker movie critic, a fact he mentioned in passing recently. She liked his books. He told me this as if it wasn’t a big deal, as if everybody had been buddies with Pauline Kael. Norman was understandably taken aback when he learned that I wanted to write about him. Like any good university spokesman, Norman would prefer that the institution get the attention. But he agreed to cooperate, if somewhat reluctantly. I was reluctant, too. I wrote in an e-mail message to Norman that I was concerned that once the article was finished he would stop calling. He told me not to worry. “You may be sure that we’ll continue to be in touch after you complete your piece,” he wrote. I hope so, Norman. You know the number. http://chronicle.com Section: Notes From Academe Volume 51, Issue 33, Page A56. Members can see the article online here, without the image. Click on Read the rest of this entry to see a pdf of the article with the nifty cartoon of Norman Zierold and Thomas Bartlett. Here’s are two articles by Norman Zierold you might like to read: Embody: focus on TM: Iconic Filmmaker David Lynch has a viable solution to a pressing problem and THE REMARKABLE DAVID LYNCH FOUNDATION — written by Norman Zierold for Healthy Referral. This entry was posted on October 13, 2011 at 10:11 pm and is filed under Articles, Education. You can follow any responses to this entry through the RSS 2.0 feed. You can leave a response, or trackback from your own site.